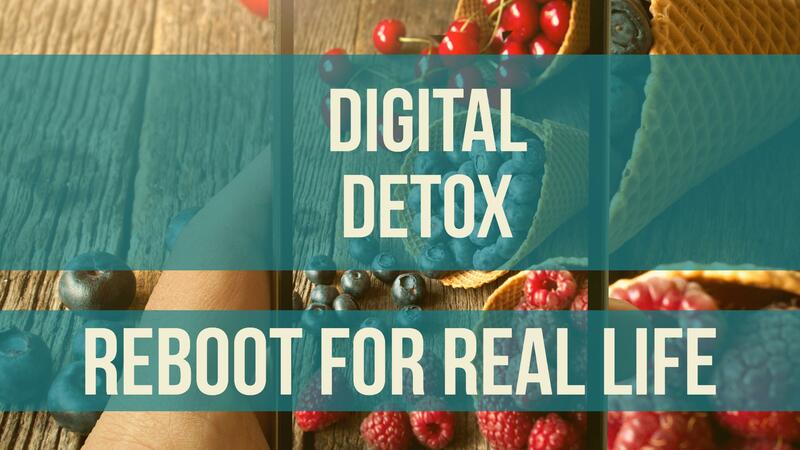 Digital Detox: Reboot Your Brain for Real Life Benefits. Taking time away from screens is healthy! 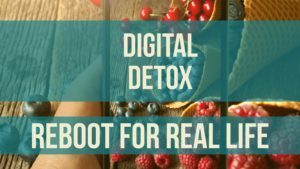 Digital Detox: Reboot Your Brain for Real Life Benefits. A digital detox is like a reboot for your brain. It helps you to be better and more efficient in your everyday life. Taking a moment to myself is a struggle for me, but I knew a digital detox would be worth the effort to disconnect. Those of you that know me personally know that I tend to take on a lot, right now my big mission is launching The Social Media Advisory Counsel. I love it, I have all this knowledge and experience I’ve gained from years of work in the corporate world, and now I get to use it to help people live safer, better lives. However, any entrepreneurial spirit will attest that this is not for the faint of heart. When you launch something like this, you do the work of about 4 people. On a slow day. We all take on too much. If you don’t know me personally, I’m sure you can relate to this in your own way, we all live crazy, busy lives. I’d be willing to wager that you also, along with me and anyone reading this, probably spend a LOT of time in front of a screen. It seems to be our way of life these days. Even good things in excess can become a burden, and I was burning out fast, when I was given what may be the best holiday gift I’ve ever received (sorry, honey). My best friend gave me the experience of a float in a sensory deprivation tank at a beautiful, locally owned place called Levity. A sensory deprivation tank is a space-ship looking vessel containing approximately 10 inches of super salinated water which gives you the effect of weightlessness. The complete dark and ability for your body to relax in this environment is said to be therapeutic, even transcendental for some. I love this sort of experience, so I was all in. My expectations were pretty high as I expected this would help me to up my meditation game, and be so relaxing that I’d come out as mellow as a yogi. There was also the possibility that my thoughts could go dark and lots of trauma might come up…dark and quiet with my thoughts…that could be dangerous. Ever the optimist, I decided to put that fear aside and go in with the intention of having a good experience. I truly believe it’s all about how things are framed. Well, I was mostly right, but what inspired this blog was the unexpected part. The dark stuff I was concerned about, didn’t make an appearance. I found myself feeling playful, happy, and cheerful. The way the salt water felt in my hair was fun. Moving around, stretching, and exploring the dark was joyful. I felt energetic and revitalized, ready to deal with the rest of the world. Not only that, but my exercise-weary muscles had no pain. Zero. This felt better than a massage, and I love a trip to the spa. I got a chance to sit and speak with the owner, who, of course, is an amazing mellow soul who showed me around and made sure I had all the info I needed before getting started, and also sat and chatted with me after my float. Knowing that this is a family endeavor and seeing his floor of pennies from friends and family, laid by hand with love, made me adore this place even more. Unfortunately when I came out, I completely forgot I wanted to give him a penny for their work of art, in hopes that he would consider me a friend of Levity. So, I’m sure you’re wondering what this has to do with social media. No, this is not a promo for Levity….it’s a promo for taking a digital detox. I took one hour to myself. The phone was away, I let the rest of the world be quiet just for a moment. My body and mind thanked me immediately. I didn’t even want to pick that phone back up. I was happy to take just a little more time away. In this busy world we forget that we are not computers. We’re not designed to run 24/7 at such a fast pace. Our systems need a reboot too. For us organic creatures that means reconnecting with the physical world, and with our physical bodies. It’s ok to check out every now and then, even for small amounts of time. We need this to function efficiently. On the other side of your digital detox, you will be MORE creative, efficient, better at work, and/or more attentive to your kids because by replenishing your systems, you have more to give. You free up some space on your hard drive, if you like metaphors. Many before me have said this, “always secure your own oxygen mask first” and we’re all right, but because people are fallible and forgetful, we need to be reminded (and often) that it’s ok and necessary to take some mindful time for yourself. I’ll gladly be the one to remind you. We’re all in it together, so if you’re better, I’m better too. Not everyone can get to Levity, but there are a million ways to do your own digital detox. In fact, the entire point is to do something for yourself, unique to you, away from a screen. I recommend trying to take at least 30 minutes once a week where you consciously put away all things digital. Taking a mindful approach to an action helps you to process it, so put it on your schedule and set a positive intention when you do. Happy Detoxing! Cyberbullying prevention starts at home. © Copyright 2014 Social Media Advisory Counsel. All Rights Reserved. All social brands represented on our website are not affiliated with SMAC, and are property of their respective owners.